The top image on the left is from Hone et al. 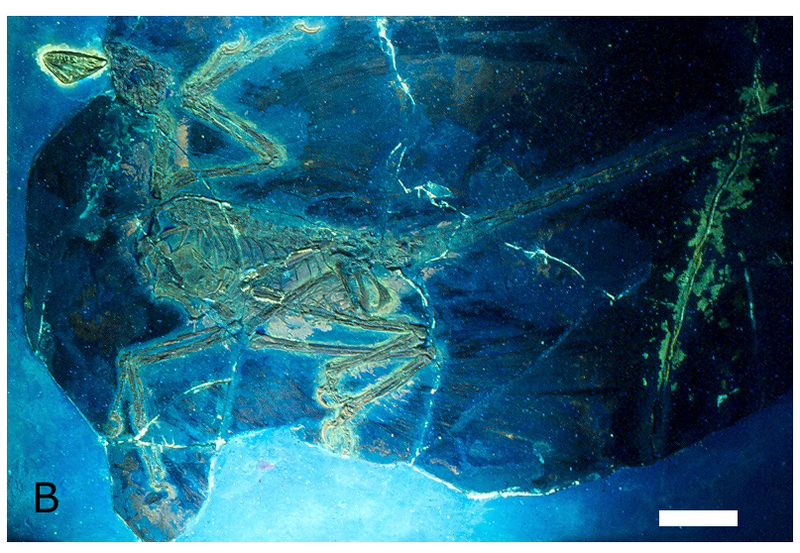 (2010) and shows the holotype of Microraptor gui under UV light. The image below, by Mick Ellison, shows a life restoration of Microraptor, and was taken from here (note: the hindlimbs could not actually get into the position shown in the image; that was done to show off all of the airfoils at once for comparative purposes). One of the key questions regarding flight in Microraptor is whether it evolved flight independently of avialans, or if it represents a morphology that was a more direct precursor to flight in birds proper. 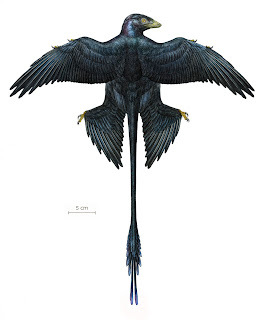 One thing I noticed a few years back is that it seems that Microraptor had a different set of "solutions" to the problem of aero control, as compared to living birds. I have since put some math to it, and the calculus bears out the intuition. Myself, Justin Hall, David Hone, and Luis Chiappe are writing this up now (see earlier cryptic blog post), but Justin has given a couple of talks on the hindwing use recently and some of you out there know that that I have been murmuring about the tail being used in aero control. All will be revealed in the full manuscript (WFTP moment) but I do think it is quite interesting that the aero control surfaces in Microraptor took advantage of pre-existing maniraptoran anatomy. In other words, you don't have to do much to your average dromaeosaurid to get it into the air. This is a potentially critical observation. For one, it suggests that the origin of flight in dinosaurs may have been more simple than previously supposed. It also suggests that flight control may have had more to do with the gains and losses of aerodynamically active morphology we see near the origin of birds than simple weight support. I am sad to say that most paleontologists don't seem to have a particularly good grip on what lift actually is, how it is used, and how it is generated. Many of my colleagues also seem to struggle with how drag fits into the whole scheme. Of course, I have lots of gaps in my knowledge, too, so I can't go pointing fingers. Nonetheless, I suspect that we are going to see a major overhaul of the models for dinosaur flight evolution in the year or two. The Ellison image is associated with a recent paper by Li et al. (2012) in Science. The authors favor display characteristics for some of the feathered morphology, particularly the tail fan. I don't discount this function at all, but it should be noted that it doesn't take much to provide a decent stabilizer or control surface for a mid-sized flying animal, and display surfaces don't have to be aerodynamically useless or costly. (Just to shore a common myth, that is not the same as saying that tail fans, crests, flaps, etc would act as rudders on flying animals. As a general rule, rudder use does not work well for a non-fixed wing flyer. Even fixed-wing aircraft do not initiate turns by using rudders; the rudder systems are for stabilization).